After launching the new Omate smartwatch in the form of the Racer last month priced at $129 it has now been revealed that the smartwatch will be the first of its kind to be assembled in Africa. It has been announced this week that the new smartwatch will be heading to Africa in locations in Congo, Ivory Coast and Cameroon to begin with during June 2015. The move is thanks to VMK who is also currently in the process of increasing smartphone sales using affordable devices within the region and hopes to provide the area with the ability to assemble other mobile devices in the future. The assembly plant that will be situated in the Republic of Congo is expected to help assemble the 50,000 units that Omate CEO Laurent Le Pen expects to sell. 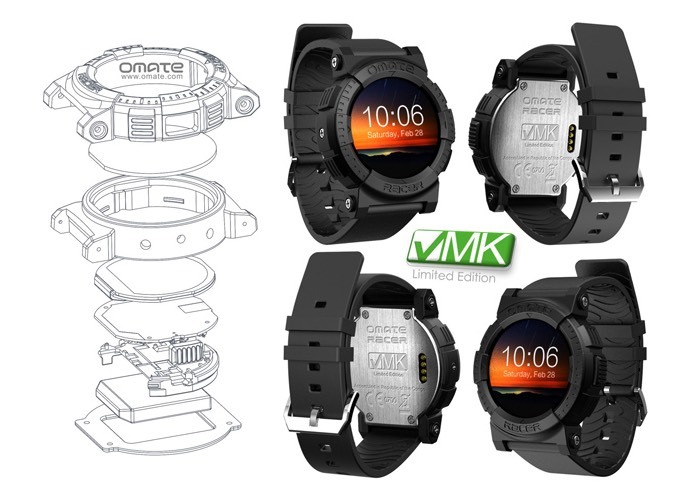 The Omate Racer is a new addition to the range of smartwaches that was originally launched over on the Kickstarter crowdfunding website. The new smartwatch is equipped with the ability to link to your apps for control or disable personal apps and system apps on the device via the LinkIt development platform for wearables by MediaTek labs. The Omate Racer Black edition is now available to preorder priced at $129. For more information on the new Omate Racer smartwatch jump over to the Omate website for details via the link below.